Why Does It Hurt When My Heart Misses The Beat (and other re-discovered classic lyrics on vinyl). It's my birthday tomorrow. 39! Each year, present wise I usually get money. Which is always very fine indeed. Today, after spending a lovely day with my parents, they gave me a wrapped up present. A record player, one with CD and MP3 malarkey as well. It was around 1990 when I last played any of my vinyl records. How different and gorgeous is the sound from a record player. It is 1984 all over again, hooray! The first song I played on my new record player was Madonna's "Holiday" from her album "Madonna" which I bought in a Co Wexford record shop a million years ago. I had to play Madonna first as my friend John Jennings would say, it would be rude not to. I have also being playing "Now That's What I Call Music 3", which I bought for my 15th birthday back in 1984, and for an album played a thousand times is still sounding wonderful. That album is pictured above. The cover is like a history of quality 80's pop. Duran Duran, Wham!, Queen, Nik Kershaw and Frankie Goes to Hollywood. There were so many perfect pop songs on that 30 track double disc album such as "White Lines (Don't Do It)" (Grandmaster and Melle Mel), "What's Love Got To Do With It" (Tina Turner), "Love Resurrection" (Alison Moyet), and "Love Wars" (Womack and Womack). The full track list is here. 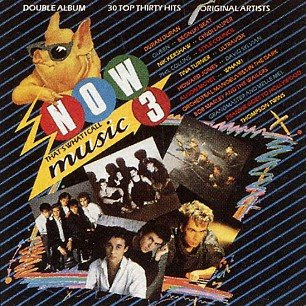 Here's three videos from "Now 3" with the original sleeve notes that appeared on the album. The Thompson Twins and "You Take Me Up". "Charted at No. 13 on 27th March - reached No. 2 on 17th April. From LP/Cassette "Into The Gap"." Bananarama and Robert De Niro's Waiting. "Charted at No. 48 on 28th February - reached No. 3 on 27th March for 2 weeks. From LP/Cassette "Bananarama"." Propaganda and Doctor Mabuse. "Charted at No. 64 on 13th March - reached No. 27 on 17th April." Me & U and Long Way 2 Go by Cassie were two of my most listened to pop r'n'b songs in 2006. The rest of her self titled debut album wasn't that great with Ditto" being the only other really memorable song. Earlier this year Cassie starred in the teen dance movie, Step Up 2: The Streets. A song by her, Is it You reached number 52 in the US singles chart. That song wasn't officially released as single in the US but became her second most downloaded song after Me & U. That song made it to number 3 in the US Billboard hot 100 singles chart and was a number one single in the UK download chart. Her new album is due out this Autumn and is provisionally titled "Connecticut Fever" and the first single, already released onto ITunes in the US is "Official Girl". It has a host of writers and is produced by Danja, who recently co-produced "4 Minutes" with Timbaland. "Official Girl" also features vocals by rapper Lil Wayne. At first I didn't think a lot of Official Girl" but it's one of those songs that ends up sticking in your head and it's clear that the winning formula of her two previous hits has been revisited but with a new base line. The video for "Official Girl" is below. What do you get when you mix something as wonderful as Nelly Furtado's "Say It Right" with something as wonderful as Rihanna's "Don't Stop The Music" together? This! 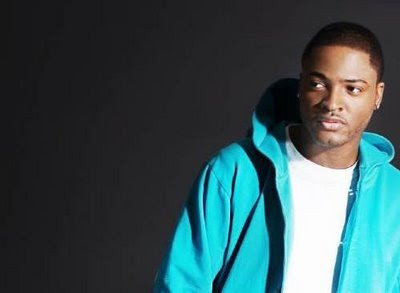 Taio Cruz's She's Like A Star is one of the songs that I think is most gorgeous this year, one that I played a lot when i heard it first a few months ago. It climbs 12 places to number 20 in the UK singles chart this week. She's like A Star has one of the sweetest hooks on it's chorus which some people would either love or find v annoying. It is also the fifth single off his album Departure". His third single Come On Girl reached number 5 last year and Taio's most recent single "I Can Be" went to number 18. The video for She's like a Star features Taio and Roxanne Drew McKee, an actress from the TV show Hollyoaks and there is also a remix of the song featuring Busta Rhymes and Sugababes, which is a bit messy I think. The original version is just fine. The video below is neither one that features Taio or any other vocalists. It's just two dancers, two guys whose style is really poetry in motion. They dance under the name MindBogglerz and they also have a Youtube post on line of them dancing to Janet's Feedback, which is also brilliant. Today in America Glen Campbell released his new album "Meet Glen Campbell". The album, which is his 59th, is a collection of covers of songs from the 1960's to this decade. The project is similar to Johnny Cash's recording of "Hurt" and other great covers that he did during that great period of his life. 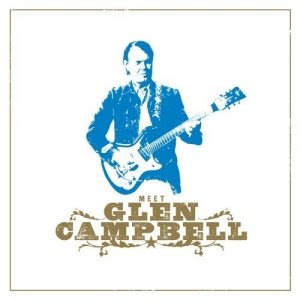 The 10 songs on "Meet Glen Campbell" are; "Jesus" (Velvet Underground), "Sing" (Travis), "Angel Dreams" and "Walls" (Tom Petty), "These Days" by (Jackson Browne), "Times Like These" (Foo Fighters), "All I want is You" (U2), "Good Riddance (Time of my life)" (Green Day), "Sadly Beautiful" (The Replacements) and "Grow Old With Me" (John Lennon). The musicians featuring on the album include some of America's finest and most respected such as Chris Chaney on bass guitar, Vinnie Colaiuta on drums, Rick Nielsen (the founder of the band, Cheap Trick) and also Wendy Melvoin, of Wendy & Lisa, on electric guitar. He is also touring with this new album. Those tour dates as well as audio of three of the songs on the album can be found on Glen's website which is here. Glen Campbell has been in the music business for over 50 years, he was 72 last April. He has sang some of the most memorable songs in country music and also covered some of the most beautiful songs such as the song below, Jim Croce's "Time In a Bottle". The performance is of one which he recorded for the BBC in 1975. Glen was a touring member of The Beach Boys, where he played as a temporary replacement for Brian Wilson. Like a lot of music stars in the 1970's Glen had his own TV show. The clip below features someone else who also had one of the most famous TV shows in the US around the same time; Cher. They sing a melody, completely live, which includes two of Glen's most well known songs; "Country Boy" and "Rhinestone Cowboy". 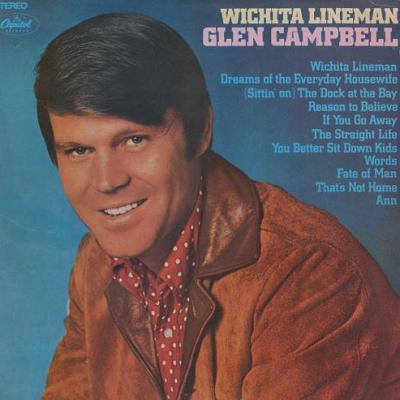 A song that would easily be in the top ten of my favourite songs of all time is "Wichita Lineman" which Glen recorded first 40 years ago this year. It is a song that both beautiful and sad at the very same time. The line; "I know I need a small vacation but it don't look like rain" just brings me back to childhood in the 1970's and the memory that it was all those pop country songs that I heard growing up made me realise that a love of music has been with me since I can remember. The "Wichita Lineman" album also included songs like "Dreams of the Everyday Housewife", "Reason To Believe", The Bee Gees "Words" and a gorgeous version of Jacques Brel's "If You Go Away". There are many performances of "Wichita Lineman" on the net but the one below is recent, only a few years old, I'm not sure exactly when. 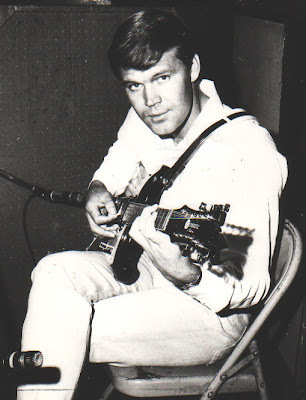 Like many other stars Glen Campbell's private life has sometimes had it's share of controversy but as a singer and guitarist throughout the history of country music, he is still simply one of the best. 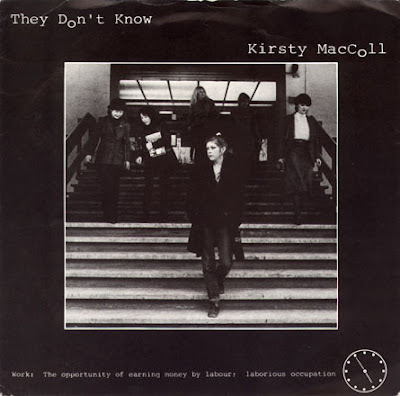 In 2009 "They Don't Know", the song written by Kirsty MacColl, will be 30 years old. it is a song forever associated with her but, unbelievably, it was never a chart hit for her. When it was being released in 1979, there was a strike at her record's distribution company which effected the singles sales. There is more on the song's history here. Kirsty's version would also never appear on a solo album by her but has been on most of her "best of's" compilations over the years. Her version of "They Don't Know" is below. "They Don't Know" was re-recorded in 1983 and was a huge hit for Tracey Ullman. It was a number 2 hit in the UK charts and number 8 in America and was one of the first of a new wave of hits by British artists in the US in the 1980's, a trend that continued throughout that decade. I have always liked Kirsty MacColl, except for Fairytale of New York" which I have never liked. I loved all of Tracey Ullman's hit singles. In 1983, as well as the success of They Don't Know she also had UK top ten hits with Breakaway and Move Over Darling, all three featured on her album You Broke My Heart in 17 Places. In 1984 Tracey released two more singles; My Guy and Sunglasses but while both were Top 30 hits, neither song made it into the top ten. A few years later in 1987 Tracey was on her way to becoming a major TV star, especially in America where her "The Tracey Ullman Show" would go on to earn four Emmy wins and was also the launchpad for a new cartoon sketch featuring the family known as The Simpsons. Here's Tracey's video for They Don't Know.. The video is a real classic, highlighting both her comic talent and cheeky girl next door image that she would often use in sketches throughout her career. The video also features a cameo by Paul McCartney. This week sees the soundtrack for the "Mamma Mia" movie at number one in the Billboard album chart and also in Australia. It is number 2 in the UK compilation charts. "Now That's what I call Music 70" is number 1. Abba however are number one in the "regular" album chart with "Abba: Gold" which has been around for years. "Mamma Mia" the movie is currently number 5 in the US where it has made $107 million to date. I have been to see the film at the cinema twice now and could easily go again, it really is the most feel good movie of the year. I think a major part of it's continuing success is that it appeals to both young and older cinema fans, because of the characters of the friends of both mother (Donna) and bride to be (Sophie). One of the positive aspects of the soundtrack is that the album actually features the songs sung by the actors in the film, something that dosen't always happen. A case being with the "Chicago" movie soundtrack where the album featured versions by Macy Gray and Anastasia. I think I still love "Honey Honey" the most but there are loads of good songs or rather any that that the three male leads don't sing solo. One of my favourite scenes was with Sky (Dominic Cooper) and Sophie (Amanda Seyfried) when they sing "Lay All Your Love On Me". Both actors really give the scene and song their all. That scene all ends in complete silliness with Sky's friends doing a male can-can chorus. It will be interesting to see in which direction the careers of Amanda Seyfried and Dominic Cooper will go now. I love Amanda Seyfried's voice in the film, I could easily go and see her in a show or concert. Dominic Cooper's voice isn't as good but it's not bad and his singing suits his character, as is the way of most of the male characters in the film. 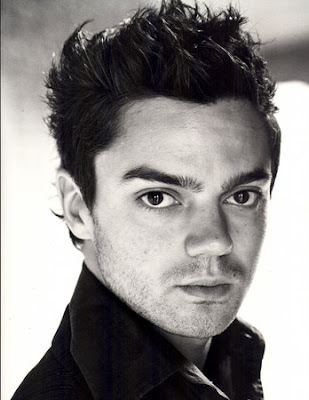 Dominic Cooper will next be seen in cinemas in "The Dutchess" with Keira Knightley and Ralph Fiennes. If the film is any good it will really make the year end on a high profile note for all concerned but especially Dominic Cooper. He's 30 years old but looks younger and therefore could play a variety of roles. If his next 2 or 3 projects are also well selected he could easily be a major name for the next decade, something that fellow British actor James McAvoy is excelling at recently. Both actors starred as friends in the comedy "Starter for Ten", a British film, that deserved a bigger audience than it got on it's cinema release. 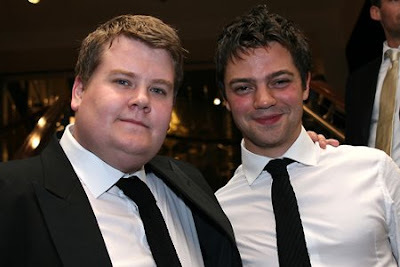 Dominic is pictured below, with his "The History Boys" co-star James Corden at the Tony Awards in New York 2 years ago. While James is looking almost statesman serious, Dominic looks like he had a Babycham too many. Bless! David Tennant's recent visit to see his fellow Doctor Who co-star, Catherine Tate, in her West End play "Under The Blue Sky" resulted in him having to leave the theatre early as over excited Doctor Who fans "began singing the show's music and waving sonic screwdrivers", during the performance. Somehow, I don't think any of those fans were under ten. More on that story here. It's just a classic example of a "who on earth would want to be a celebrity" type story. Catherine Tate, professionally, managed to ignore the people in the audience but you can imagine there were a few choice words in the dressing room later. A few months ago I decided that I don't watch TV enough to merit paying for cable every month so I got rid of my Sky or NTL as it's known in Ireland. So far, I don't regret it, though I may wish it back as X Factor looks like it could be a great Dannii and Cheryl show this Autumn. Because of not having TV stations anymore I find I am reading more and watching all those DVD's you buy and never watch. I couldn't do without my internet though. Especially Youtube. 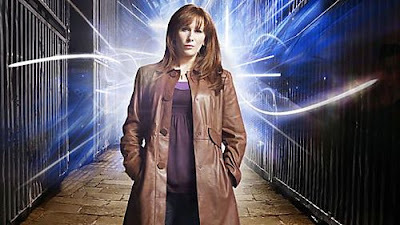 One series that I haven't really seen at all has been the most recent Doctor Who so I don't really have an opinion of what Catherine Tate's Donna was like. What I did like, a lot, was her interview with the forever joyful Graham Norton recently. The interview is below. The entire video is funny but my favourite bit is when she tells of the fact that she wasn't a fan of Doctor Who before joining the show and her reaction when told that one of the show's ultimate villains, Darvos, was returning. It's classic TV. I think 2008 will be the year that I finally, and sadly, have more or less lost interest in the UK singles charts. In the 1980's most new single releases charted around the top 50 or 60 positions and slowly made their way up the charts, sometimes taking weeks to get to number one. Very few songs went straight in at number one. Those were the days that pop singles made a lot of money, songs like George Michael's "Careless Whisper" and Jennifer Rush's "The Power of Love" sold over a million copies on 7" vinyl alone. By the end of that wonderful decade the amount of new pop acts was increasing all the time, their success was due to high profile publicity from a mixture of MTV, pop magazines and shows like "Top of The Pops" and Saturday morning TV shows. For most of the 1990's and early 2000's there were several new single releases each Friday and it would not be unusual to see 5 0r 6 brand new entries in the singles charts and at least a dozen or more in the week's top 40. This trend is no longer happening. Today, in 2008, I truly believe that the download is slowly killing the actual concept of the hit song. HMV now just sells a selection of CD singles, their branch in Grafton Street, here in Dublin, has a tiny display stand with a selection of 12 songs. These are usually the edit of the single song and a 3 or 4 minute remix. These are usually priced at €2.99 or €4.99 but when the average price of a download per song is 99c it's obvious that the CD single is no longer good value. How I loved the days when you bought a new CD single and there were 3 or 4 remixes or a live track or cover version included, sometimes there were two CD singles of the same song. I have most of Madonna's CD singles and nearly all her early vinyl singles. It just isn't the same with downloads. I have all her downloads! Like, wow! Go, you! Today, Sunday 10th August, Katy Perry's "I Kissed a Girl" went from number 4 in the UK charts to number 1. No one is surprised. The song is currently 7 weeks at number one in the equally boring Billboard Hot 100 singles chart. "I Kissed a Girl" has also got to number one, to date, in Sweden, Canada and Australia. It is currently number 2 in Ireland. Guess where it will be next week! The current UK singles charts features "American Boy" by Estelle featuring Kanye West at 36, "Cry for You" by September at 35, Nickleback's "Rock Star" at number 27 and Sam Sparro's "Black & Gold" at 21. These are all good songs but they are just some of the many songs which have been in the UK charts for months. The reason for that is not because they are so brilliant that they deserve to be in the charts for ages, it's because there is very few other new singles releases which receives enough publicity and/or airplay that they chart in the top 40. If music retailers are only selling a handful of CD singles as well this also keeps certain songs in the charts for longer than they would have been before. Does anyone know when a song is officially released as a download, I don't think so. This week's UK singles chart top 10 includes Rihanna's "Disturbia" (which has been on the radio for weeks already), The Verve's "Love is Noise" and The Script's "The Man Who Can't be Moved". These songs are new now but expect to see them still in the UK charts in 2 or 3 months time. Unlike, The Saturdays, whose single "If This Is Love" goes in the wrong direction this week as it falls to number 13 after only one week in the top ten. I think there is something almost tragic in popular culture that the UK singles charts have become a lazy playground. It used to be so exciting to see which pop act did best each Sunday but the UK pop chart which was always one of the best in the world is now one of the dullest. What has also happened with the lack of TV shows promoting new pop acts, as well as established ones, as well as the loss of magazines like "Smash Hits! ", is that unless a song is play-listed on Radio 1 in the UK it hasn't a hope of becoming a hit. Some songs, which deserve to be hit singles, never are released at all. If an artist has a hit single and the following single isn't a hit there then aren't any more single releases from the accompanying album. Long gone are the days when an album had 5 0r even 6 hit singles taken from it, such as albums by Michael or Janet Jackson, Madonna and Destiny's Child. One of my most favourite songs from last year, which I doubt will ever be a single, was on pop sisters Aly & AJ's "Insomniatic" album. That song was "Silence", a gorgeous little pop ballad, which, I think is an example of a song; if it had been a single release combined with having a show like "Top Of The Pops" or "CD:UK" to promote it, would easily have been a UK hit. Here it is.